One of the most interesting and original bridal shows in Vancouver is back in Novenber this year. 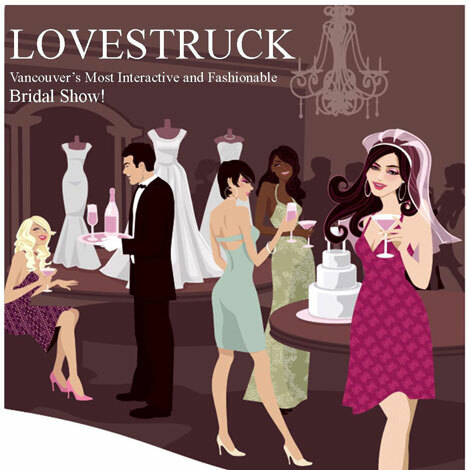 Lovestruck's interactive format is a very welcome deviation from the traditional wedding show rat-maze layouts! Essentially a large cocktail party, LOVESTRUCK will be a Bridal show you just don't want to miss...We feel the "bridal show" is just one of those things you have to experience when you plan a wedding...you just HAVE to go to at least one, unfortunately so many wedding shows lack luster and do little more than overwhelm and already overwhelmed bride. So we've made it relaxed and fun...pampering, make-up chairs, nail spa's. And in order to make the show fun AND helpful...we have added some optional workshops so that brides can pop into these rooms and can actually get some valuable information and insight on topics such as: Choosing your Photographer, Wedding Planning 101, What's Hot in Table-top and more. We have created a show that is a memorable experience...a fun, helpful, useful day to help you to ensure you plan the very best wedding possible! We believe there is a better show out there... for everyone, and LOVESTRUCK is that show...so come by, bring your girls, choose your vendors, pick up your keepsake sterling silver necklace and tell them you're a LOVESTRUCK bride...change has never felt so good!